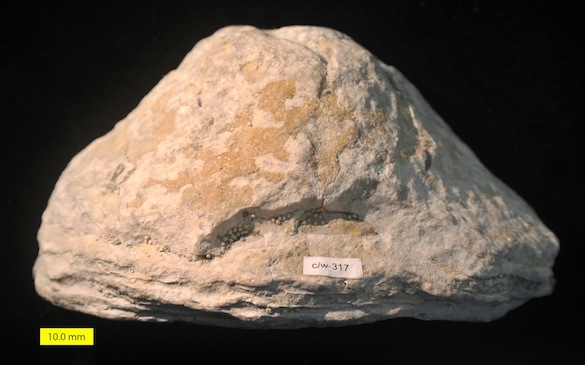 Stromatoporoids are extinct sponges that formed thick, laminated skeletons of calcite. They can be very common in Silurian and Devonian carbonate units, sometimes forming extensive reefs. The stromatoporoid above is Densastroma pexisum (Yavorsky, 1929) collected from the Mustjala Member of the Jaani Formation (Silurian, Wenlock) exposed on Saaremaa Island, Estonia. It was part of Rob McConnell’s excellent Senior Independent Study he completed in 2010. Stromatoporoids are rather featureless lumps until you cut a section through them. Then you see their characteristic laminae of calcite. Looking very close you might also glimpse the tiny vertical pillars between the laminae. Identifying the species of stromatoporoid always involves a thin-section or acetate peel to discern the forms of the pillars and laminae. In the upper left of the sectioned D. pexisum is an oval boring cut through the fabric of the stromatoporoid. This is likely the trace fossil Osprioneides kampto Beuck and Wisshak, 2008. This is the largest known Palaeozoic boring. It is relatively common in Silurian stromatoporoids of the Baltic region. Last year Olev Vinn, Mari-Ann Mõtus and I published a paper describing the same ichnospecies in large trepostome bryozoans from the Estonian Ordovician. 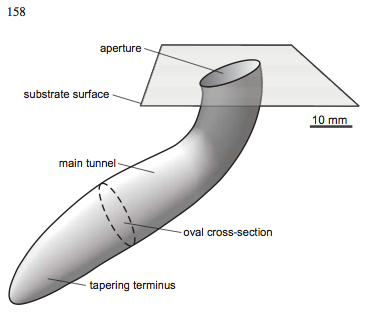 This diagram of O. kampto is from Figure 8 of the Beuck et al. (2008) paper. The organism that made the boring was almost certainly a filter-feeding worm of some kind that gained a feeding advantage by placing itself high on a hard substrate. 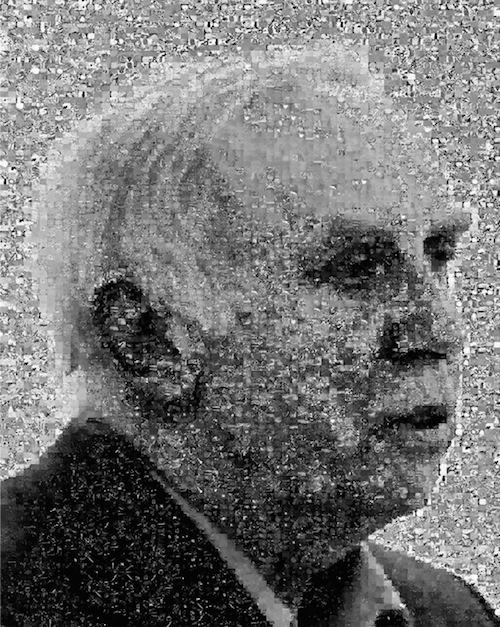 Densastroma was originally named in 1958 by Erik Flügel (1934-2004). He combined the Latin densus with the Greek stroma, meaning “dense-layered”. (Yes, taxonomic purists will object to the mix of Latin and Greek in one name.) Flügel was a highly accomplished and diverse scientist who founded the Institute of Paleontology at the University of Erlangen-Nuremberg as well as the journal Facies. He is best known for his advocacy of detailed study of carbonate facies through petrography (“microfacies analysis“), developing a series of techniques and principles that I found very useful in my dissertation work. The above image is a fitting tribute to Erik Flügel made by Chris Schulbert. It is a portrait made of 7000 carbonate thin-sections! Beuck, L., Wisshak, M., Munnecke, A. and Freiwald, A. 2008. 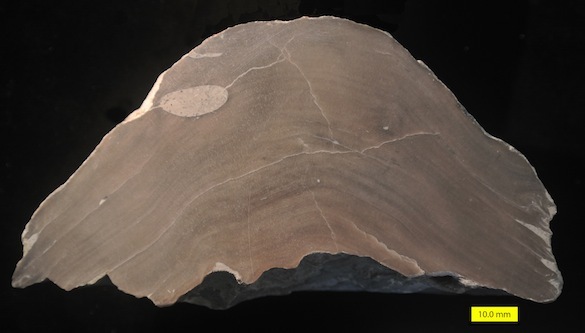 A giant boring in a Silurian stromatoporoid analysed by computer tomography. Acta Palaeontologica Polonica 53: 149-160. Flügel, E. 1959. Die Gattung Actinostroma Nicholson und ihre Arten (Stromatoporoidea). Annalen des Naturhistorischen Museums in Wien 63: 90-273. Freiwald, A. 2004. Erik Flügel: 1934–2004. Facies 50: 149-159. Vinn, O., Wilson, M.A. and Mõtus, M.-A. 2014. The earliest giant Osprioneides borings from the Sandbian (Late Ordovician) of Estonia. PLoS ONE 9(6): e99455. doi:10.1371/journal.pone.0099455.